The Animas® Vibe® System consists of the Animas® Vibe® Insulin Pump paired with the Dexcom G4® PLATINUM Sensor and Transmitter. The Animas® Vibe® Insulin Pump is indicated for continuous subcutaneous insulin infusion for the management of insulin-requiring diabetes. It can be used solely for continuous insulin delivery and as part of the Animas® Vibe® System to receive and display continuous glucose measurements from the Dexcom G4® PLATINUM Sensor and Transmitter. The Animas® Vibe® System’s continuous glucose monitoring (CGM) is indicated for detecting trends and tracking patterns in persons (age 2 and older) with diabetes, and is intended to complement, not replace, information obtained from standard home glucose monitoring devices. CGM aids in the detection of episodes of hyperglycemia and hypoglycemia, facilitating both acute and long-term therapy adjustments, which may minimize these excursions. Interpretation of results from the Dexcom G4® PLATINUM Sensor and Transmitter should be based on the trends and patterns seen with several sequential readings over time. The System is intended for single patient use and requires a prescription. Consider the following for pediatric use of the Animas® Vibe® System. 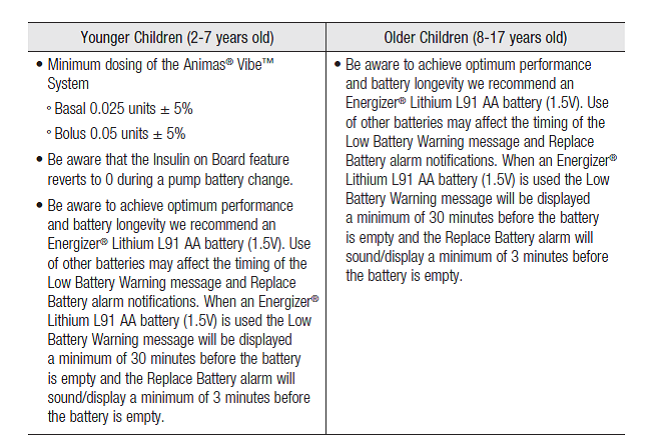 Refer to the Caregiver Warnings in the “Before You Begin” section of the Animas® Vibe® Insulin Pump & CGM System Owner’s Booklet for more information. The Animas® Vibe® System consists of the Animas® Vibe® Insulin Pump and the Dexcom G4® PLATINUM Sensor and Transmitter. The pump is used to deliver insulin continuously throughout the day (basal insulin), and to deliver a single amount (bolus insulin) at meal times to cover carbs in the foods you eat. Bolus insulin is also used to lower a high BG. An insulin cartridge with about a 3-day supply of insulin is inserted into the pump. The pump connects to your body with a disposable infusion set that you replace every few days when you refill the pump with insulin. The Dexcom G4® PLATINUM Sensor and Transmitter automatically collect glucose readings every 5 minutes from fluid below your skin. The Sensor sits below your skin and is connected to the Transmitter. Readings are sent wirelessly to the pump display where you are alerted if your glucose readings are trending low or high, and can be used to help you make decisions for managing your diabetes. Every 7 days the disposable Sensor is replaced and a new one is connected to the same Transmitter. Transmitters are replaced about every 6 months. While using the Animas® Vibe® System, you will continue to use a BG meter to obtain periodic glucose test results from a blood sample from your fingertips. Measurements from a BG meter are used to calibrate the Animas® Vibe® System on a regular basis, and to help you make treatment decisions. It is necessary to calibrate the Animas® Vibe® System to help ensure the accuracy of glucose readings from the Dexcom G4® PLATINUM Sensor and Transmitter. The Animas® Vibe® Insulin Pump may be used with or without the Dexcom G4® PLATINUM Sensor and Transmitter. If the Dexcom G4® PLATINUM Sensor and Transmitter are not used, you will not be able to automatically collect and receive glucose readings from fluid below your skin. • Your Animas® Vibe® Insulin Pump provides an automated way to deliver basal and bolus insulin. The pump also provides an automated way to store personal diabetes and insulin health profile data that you can use to fine tune insulin delivery. This includes being able to store up to 12 Insulin Sensitivity Factors, 12 Insulin to Carb Ratios and 12 BG Targets, for different times of the day. Up to 4 basal programs can be stored in the pump to meet varying daily insulin needs. You can always use the TEMP Basal feature on your pump to temporarily adjust basal rates for a selected period of time. • When delivering a bolus on your Animas® Vibe® Insulin Pump, you have the option to deliver it all at once (Normal Bolus), or program the pump to deliver some now and the rest later (Combo Bolus). You can even adjust the speed of bolus insulin delivery. A built-in calculator feature helps you calculate the right bolus amount for any situation. • The calculator feature on your Animas® Vibe® Insulin Pump helps take the guesswork out of calculating the right bolus amount to cover carbs (ezCarb Bolus) or to lower a high BG (ezBG Bolus). A pre-programmed Food Database in the pump gives you access to carb amounts in many common foods when using the calculator feature. The Insulin on Board (IOB) feature on your pump automatically keeps track of insulin that may still be in your body from a previous bolus and factors that amount in when using the calculator feature. This helps prevent stacking of boluses and can stop you from bolusing too much insulin. • Several safety features are built into the Animas® Vibe® Insulin Pump such as notifying you if you exceed the basal or bolus insulin limits that you set. You can set personal reminders on the pump to remind you to check your BG, and store guidelines to follow on sick days. If needed, the Suspend feature lets you stop all insulin delivery while still allowing you to stay connected to the pump. •Your Animas® Vibe® Insulin Pump automatically stores specific insulin and pump profile data. This includes records of bolus delivery, changes in basal rates, how many times you suspended insulin delivery, and pump priming. You can access these records at any time. • When you enable CGM on your Animas® Vibe® System, you will be able to continuously monitor your glucose levels measured from fluid below your skin (interstitial fluid). CGM readings are displayed on your pump every 5 minutes. When you are unable to test and track your BG with a BG meter, such as when sleeping, CGM provides a way to keep track of glucose cycles. CGM will let you know if your CGM readings are holding steady, or trending low or high. CGM is designed to complement regular testing of your BG with a BG meter and does not replace regular BG testing. If CGM readings are not consistent with the way you feel or they are trending high or low, you should test your BG with a BG meter and use that value to make any necessary treatment decisions. • Test their BG levels four to six times per day or as recommended by their HCP. • See their HCP regularly. • Respond to pump alerts, warnings, and alarms because they are visually or hearing impaired. Not following these guidelines will make it hard for you to determine how much insulin you need based on your current health status and the foods you eat. Not seeing your HCP on a regular basis will not allow them to make adjustments to your pump settings and diabetes treatment plan that would be beneficial to your health. Not being able to respond to pump notifications means you may not be aware of certain health conditions or problems with your pump that require your attention. • Remove the Dexcom G4® PLATINUM Sensor and Transmitter prior to Magnetic Resonance Imaging (MRI), Computed Tomography (CT) scan, or diathermy treatment. The Dexcom G4® PLATINUM Sensor and Transmitter have not been tested during MRI or CT scans or with diathermy treatment. The magnetic fields and heat could damage the Sensor and Transmitter so that they might not record or transmit Sensor glucose readings or provide alerts, and you might miss a low or high blood glucose value. • Taking medications containing acetaminophen while wearing the Sensor may falsely raise your Sensor glucose readings. The level of inaccuracy depends on the amount of acetaminophen active in your body and may be different for each person. As with any medical device, there are risks associated with using the Animas® Vibe® System. While some of the risks are the same as with multiple daily injections of insulin, there are additional risks associated with continuous insulin delivery and continuous glucose monitoring. Review these risks with your HCP before you begin using the Animas® Vibe® System. • Not reading the Owner’s Booklet or following the instructions for use poses a major risk for using the Animas® Vibe® System. It is important to follow the proper procedures for setting up and using your system. Not following the proper procedures can lead to user error and result in serious injury to your health, or damage to the system. • Other risks associated with Animas® Vibe® System include the possible dangers of over delivery and under delivery of insulin. Over delivery of insulin can result in very low BG levels (hypoglycemia). Under delivery of insulin can result in very high BG levels (hyperglycemia). Over or under delivery of insulin may be caused by problems with the pump or problems with the infusion set. It may also be the result of the user not making the right decisions for how much insulin to take. • Any damage to the system, or system malfunction, can result in over delivery or under delivery of insulin. It can also leave you without your primary means of delivering insulin. Make sure to follow the safety information throughout the Owner’s Booklet, such as what to do with your system when undergoing certain medical procedures. • Risks associated with infusion sets include occlusions or air bubbles in the tubing which can affect the delivery of insulin. Also, bruising and infection may occur at the infusion site. • If you enable CGM on your Animas® Vibe® System, there is a risk of relying on CGM readings for making treatment decisions. CGM readings from interstitial fluid are different than BG values from a BG meter and should not be used for making treatment decisions, such as how much insulin to take. Relying on CGM readings to make treatment decisions may result in over delivery or under delivery of insulin. There is also a risk of bruising or infection at the Sensor insertion site. 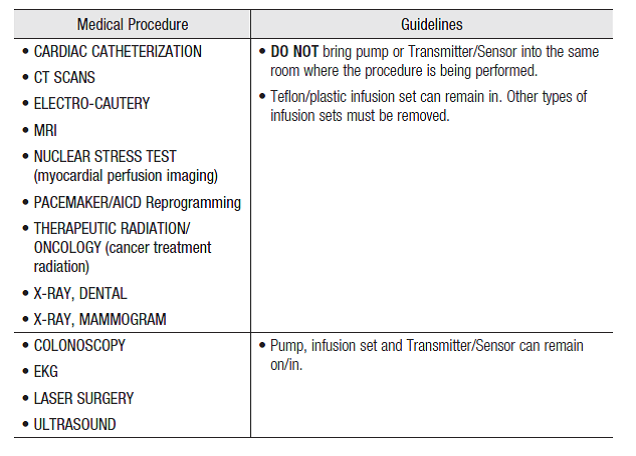 • Refer to the Warnings and Precautions in the “Before You Begin” section of the Animas® Vibe® Insulin Pump & CGM System Owner’s Booklet for information on risks associated with infusion set and Sensor insertion sites. For risks associate with diabetic ketoacidosis (DKA) such as nausea and vomiting, refer to the Diabetic Ketoacidosis (DKA) section in Chapter 15 in Section I of the Owner’s Booklet. Your Animas® Vibe® Insulin Pump is designed and calibrated to deliver U100 rapid-acting insulin. The following rapid-acting insulin has been tested by Animas® and found to be safe for use in the System: Humalog® and NovoLog®. The use of any other insulin with your System has not been tested. NOTE: DO NOT exceed the insulin manufacturer’s recommended temperature and humidity ranges when operating the Animas® Vibe® Insulin Pump. Your Animas® Vibe® System is designed to work safely and effectively in the presence of nearby wireless devices, and will not affect their performance. The Animas® Vibe® System is designed to communicate only with the Dexcom G4® Transmitter via radio frequency. See Chapter 13 in Section II of the Animas® Vibe® Insulin Pump & CGM System Owner’s Booklet for complete information. Your Animas® Vibe® Insulin Pump has been designed to operate in the presence of common sources of electrostatic and electromagnetic interference, such as store security systems. However, your pump should not be exposed to very strong electromagnetic fields, such as Magnetic Resonance Imaging (MRI), RF welders, magnets used to lift automobiles, and some “free-fall” amusement park rides. Very strong magnetic fields, such as in an MRI, can damage the System. Your system is designed to work safely and effectively when used within the operating guidelines covered in the Owner’s Booklet. These include the temperature, humidity, altitude and air pressure limitations noted in the Technical Specifications sections in Chapter 17 in Section I and Chapter 13 in Section II of the Animas® Vibe® Insulin Pump & CGM System Owner’s Booklet. Some environmental factors such as high gravity forces (e.g., when riding a roller coaster) or flying in aircraft without cabin pressurization can interfere with insulin delivery but will not damage the pump. Other environmental factors such as entering an area where there might be explosive gases can damage the pump. The Owner’s Booklet will provide information on those known environmental conditions and factors that can impact the safety and performance of the system. If you are unsure of whether a certain environmental condition or factor will impact the system or your health, contact your HCP or Customer Service. Carefully read all Contraindications, Warnings and Precautions before using your Animas® Vibe® Insulin System. If you do not understand something or have any questions, consult your HCP and/or contact Customer Service. Warnings are potential hazards that can damage the device, can cause over delivery and under delivery of insulin, or create other situations that can result in serious injury to your health, including death. • DO NOT begin using your pump until you have read the Owner’s Booklet. Not following the instructions or troubleshooting techniques can damage the pump and/or result in over delivery or under delivery of insulin. This could lead to very low (hypoglycemia) or very high (hyperglycemia) BG levels. • CHECK with your HCP regarding your individual training needs. DO NOT attempt to connect to your pump before you have been trained on your pump. Failure to consult with your health care provider about using your pump without the necessary training could result in serious injury or death. • DO NOT use any other insulin with your pump other than the U100 rapid‐acting insulin (Humalog® and NovoLog®) listed in the Owner’s Booklet. Use of the incorrect insulin, or insulin with a greater or lesser concentration, may result in over delivery or under delivery of insulin. This could lead to very low or very high BG levels. Very high BG levels may also lead to diabetic ketoacidosis (DKA). • DO NOT put any other medication or substance inside the pump. The pump is only indicated for the use of rapid-acting insulin. The use of other medications or substances can damage the pump, and result in injury if infused. • ALWAYS have an alternative method of administering insulin if delivery is interrupted on your pump for any reason. Because your pump uses only rapid-acting insulin, you will not have any long-acting insulin in your body. To avoid the risk of a very high BG level or a buildup of ketones in the blood (ketoacidosis), you must be prepared to give yourself an injection of insulin. • DO NOT allow small children (either pump users or non-users) to come in contact with or ingest small pump, sensor, or transmitter component pieces. Small component pieces could pose a choking hazard. If ingested or swallowed, these small component pieces may cause internal injury or infection. For example, the batteries contain chemicals that may be especially harmful to children. • DO NOT begin using the pump until your HCP has confirmed which pump settings and Advanced Features on your pump are right for you. Many pump personal settings, such as your Basal Rates, Insulin to Carb (I:C) ratios, Insulin Sensitivity Factors (ISF), BG Targets, and Insulin on Board (IOB) duration, should be determined only with input from your HCP. Advanced Features, such as Extended Bolus, Combo Bolus, Insulin on Board, and the Carb and BG Bolus Calculators, require a greater knowledge of insulin pumping and advanced self-care skills, and input from your HCP. Failure to have the correct settings or not following the correct instructions for using the Advanced Features can result in over delivery or under delivery of insulin. • DO NOT program or deliver a bolus on your pump unless you know how much insulin may be remaining from a previous bolus. Delivering a new bolus on top of a previous bolus is called “bolus stacking”. Bolus stacking can result in over delivery of insulin, which can lead to serious injury or death. Discuss bolus stacking with your HCP before you begin using the bolus features on your pump. • ALWAYS review changes in your pump settings with your HCP to make sure they are correct. Incorrect settings can result in under delivery or over delivery of insulin. • DO NOT reuse cartridges or infusion sets. They should be discarded after each use to avoid contamination or infection. ALWAYS discard used cartridges and infusion sets according to local regulations for the safe disposal of medical waste. Contact your HCP or local waste collection agency for more information. Failure to follow these guidelines can pose health hazards. • DO NOT deliver a suggested bolus amount based on the bolus calculator if you have already administered a manual injection by syringe or pen. The bolus calculator does not account for insulin amounts from manual injections and could prompt more insulin to be delivered than needed, and result in hypoglycemia. Contact your HCP to know how long to wait after administering a manual injection before relying on the bolus calculator. • DO NOT deliver a “suggested” bolus amount from bolus calculations on your pump until you have reviewed the amount on the pump display. If you dose an insulin amount that is too high or too low, this could lead to a very low (hypoglycemia) or very high (hyperglycemia) BG level. You can always adjust the insulin units up or down before you decide to administer your bolus. Discuss the bolus calculator feature and all relevant personal settings with your HCP before using the calculator for the first time. • NEVER start any part of the Prime/Rewind sequence on your pump while the infusion set is connected to your body. Always disconnect before you begin the sequence. The Prime/Rewind sequence includes steps for rewinding the pump motor, loading an insulin cartridge, and priming the infusion set tubing. Failure to disconnect your infusion set from your body before performing these steps can result in over delivery of insulin. If your pump sustains internal damage, the amount of unintended insulin delivery could be significant. This could result in serious injury or death from hypoglycemia. • NEVER tighten the cartridge cap when your infusion set is attached to your body. Tightening the cartridge cap while your infusion set is attached to your body may disrupt the flow of insulin through the tubing that is threaded through the cap. • MAKE SURE to twist the Luer connector an extra quarter of a turn to ensure a secure connection between the cartridge and infusion set tubing. If the connection is not secure, insulin may leak around the cartridge, resulting in under delivery of insulin. • DO NOT remove the Audio Bolus/ezBolus™ button from the right side of your pump. Removing the button can damage the pump, compromise the waterproof feature of your pump, and result in over delivery or under delivery of insulin. This can lead to very low (hypoglycemia) or very high (hyperglycemia) BG levels. • CHECK the battery cap vent and primary vent below the cartridge cap to make sure they are not clogged whenever you replace the battery, cartridge or infusion set. DO NOT use the pump if the vents are clogged. The vents allow air to flow in and out of the pump, and have a membrane on the inside that helps keep your pump waterproof. Remove any debris from the vents using your fingers and a soft cloth. • DO NOT use a sharp object to clean the vents or you may puncture the vents/membrane and compromise the waterproof feature of your pump. Replace the battery cap if you are unable to remove the debris from the battery cap vent. See Chapter 12 in Section I of the Animas® Vibe® Insulin Pump & CGM System Owner’s Booklet. • DO NOT use excessive force to tighten the battery cap. This can cause your pump case to crack. Cracks, chips, or damage to your pump can impact the battery contact/and or waterproof feature of your pump. • DO NOT use any batteries in your pump other than what is recommended in this Owner’s Booklet. Other batteries do not have the necessary characteristics to power your pump, and can damage the pump and/or result in over delivery or under delivery of insulin. This can lead to very low (hypoglycemia) or very high (hyperglycemia) BG levels. Use of other batteries will void the pump warranty. See Chapter 3 in Section I of the Animas® Vibe® Insulin Pump & CGM System Owner’s Booklet. • AVOID infusion sites on skin areas with tattoos, or areas with rough patches or scarring from your pump or insulin injections. These skin areas can cause redness, irritation, swelling, infection, and not allow for the intended amount of insulin delivery. • DO NOT expose the pump to very strong electromagnetic fields. ALWAYS remove the pump before entering an area where there are very strong magnets. If you plan to undergo an MRI, remove your pump and keep it outside the room during the procedure. These types of energy fields can damage the System and lead to over delivery or under delivery of insulin. This could lead to very low (hypoglycemia) or very high (hyperglycemia) BG levels. • DO NOT expose the pump to any medical procedure that involves the use of energy fields (for example, ionizing radiation or magnetic radiation). ALWAYS remove the Animas® Vibe® System (pump, Sensor and Transmitter) before entering the room where one of these procedures will be performed. These types of energy fields can damage the System and lead to over delivery or under delivery of insulin. This could lead to very low (hypoglycemia) or very high (hyperglycemia) BG levels. Caregivers are responsible for helping to ensure safe and effective delivery of insulin to people in their care. To assist Caregivers, there are a number of safety features on the Animas® Vibe® System to help prevent injury to those receiving insulin therapy. • CHECK to ensure maximum insulin delivery limits in the pump have been set. Contact the HCP to determine the appropriate limits for basal rate, and bolus, over a 2-hour period and over a 24-hour period. • DISABLE the Audio Bolus feature to prevent an inadvertent bolus delivery. • SET high and low CGM Warnings to receive notifications when CGM readings fall out of range or when CGM readings are rising or falling faster than the limits you set in the pump. Contact the HCP to determine appropriate CGM Warning settings. • CONFIRM audio Alerts, Warnings, and Alarm volume settings are appropriately set so any notifications will be heard and can be addressed. • ALWAYS lock the pump when not in use to avoid inadvertent button presses that may lead to inadvertent bolus delivery or a change to pump settings and may affect insulin delivery. • IT IS RECOMMENDED for patients ages 7 and under to use a tamper resistant case that shields the buttons from accidental button pushing that can lead to incorrect insulin delivery. • CONTINUE to reinforce with children the proper use of the pump and associated risks. 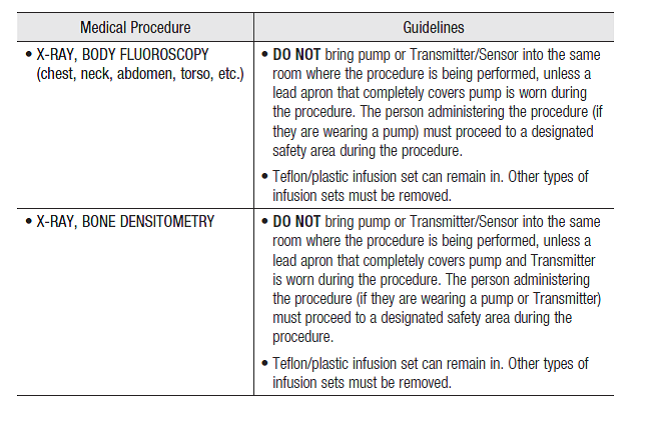 The following guidelines cover the pump, Transmitter/Sensor, and infusion sets, and apply to the patient and/or HCP administering the procedure. Precautions indicate potential hazards that can damage the device and cause moderate to mild injury to your health. • DO NOT open the pump other than to replace the battery or insulin cartridge. Your pump is a sealed device that should be opened ONLY by the manufacturer. If your pump seal is broken by anyone other than an authorized Animas® factory technician, or if the back label on your pump is removed, your pump is no longer waterproof and the warranty is voided. • DO NOT place your pump more than 12 vertical inches (30 centimeters) above your infusion site, as it may lead to over delivery of insulin. If you place your pump within 12 vertical inches (30 centimeters) of the infusion site, or at a vertically lower position than the infusion site, this condition is eliminated. • CHECK the infusion site daily for proper placement, air bubbles and leaks. DO NOT use an infusion set that is not properly placed, has air bubbles or has leaks. Improperly placed infusion sites, air bubbles or leaks can result in under delivery of insulin. • CHECK the infusion set tubing daily for any damage, leaks or kinks. DO NOT use infusion set tubing that is damaged, has leaks or is kinked. Damaged, leaking or kinked tubing can restrict or stop insulin delivery and result in under delivery of insulin. • CHANGE your infusion set every 2 to 3 days as recommended by your HCP to avoid infection. Use clean hands when handling infusion sets. Clean the skin area near the intended insertion site. Contact your HCP if you have signs or symptoms of infection at your insulin infusion site or Sensor insertion site. • CHECK the cartridge for leaks, cracks, or other damage each time you change it. To avoid leakage, make sure to securely tighten the Luer connection between the cartridge and infusion set. You can check for leaks by wrapping a tissue around the Luer connection to see if it gets wet. • CHECK the insulin cartridge o-rings for damage (breaks, cracks or fraying) prior to inserting a new cartridge into your pump. DO NOT use a cartridge that has damaged o-rings. If the o-rings are damaged, replace the cartridge with a new one. Damaged cartridge o-rings can result in under delivery or over delivery of insulin. • CHECK the battery cap o‐ring for damage (breaks, cracks or fraying) whenever you replace the pump battery. DO NOT use a battery cap that has a damaged o-ring or does not fit securely. If the o-ring is damaged or not securely attached, replace the battery cap with a new one. A damaged battery cap o-ring, or one that does not fit securely, can impact the battery contact and/or the waterproof feature of your pump. See Chapter 3 in Section I of the Animas® Vibe® Insulin Pump & CGM System Owner’s Booklet. • CHECK your pump personal settings whenever you change the pump battery to make sure they were saved. It is important that your pump is set correctly for your insulin delivery needs and current health status. Not having the correct settings can result in over delivery or under delivery of insulin. Consult your HCP as needed. • CONFIRM that you can feel the pump vibrate and you can hear audible tones whenever you change the pump battery. This is a built-in safety check every time you replace the pump battery. It is important that these two features are working correctly as they are used to confirm certain pump operations and to alert you to conditions that require your attention. • KEEP the communication window on the pump free of obstructions, if you use the download feature. Solid objects between the window and the wireless download cable can interfere with transmission. Refer to the Instructions for Use included with the wireless download cable. Contact Customer Service for information regarding compatible diabetes management software that you can use to track, review and analyze pump data on your computer. • CONFIRM Alerts, Warnings, and Alarms on your pump as soon as possible since the pump uses battery power to display, sound and vibrate each notification. If you do not confirm notifications, your pump will continue to use battery power as the notifications repeat and progress. This will result in reduced battery life. • ALWAYS look at the pump display for confirmation that an intended Audio Bolus amount is correct, when you first begin using the Audio Bolus feature. This will ensure you are correctly using the audio/vibration prompts and button pushes to deliver the intended bolus amount. See Chapter 9 in Section I of the Animas® Vibe® Insulin Pump & CGM System Owner’s Booklet. • CONTACT your HCP about lifestyle changes such as starting or stopping your exercise program or if you experience significant weight loss/gain. These changes can affect the way your body uses insulin. Your basal rates may need to be modified. Failure to adjust your basal rates accordingly may result in serious injury. • DO NOT stop using your pump if you are ill, unless instructed to do so by your HCP. Even when you are sick, your body still needs insulin. Contact your HCP for further instructions as insulin needs may change during this time. See Chapter 15 in Section I of the Animas® Vibe® Insulin Pump & CGM System Owner’s Booklet. • DISCONNECT from your pump when undertaking activities that involve rapid changes in altitude or gravitational force. Although such changes will not cause damage to the pump, they can interfere with proper insulin delivery and result in injury. If you are unsure whether the activity is likely to interfere with your pump’s delivery of insulin, then disconnect temporarily during the activity. • MAKE SURE to have someone around you (family, friends, etc.) who understands diabetes, insulin and pump therapy. In the event of an emergency, they can help you. Make sure they are familiar with any information given to you by your HCP. Users should always contact their HCP or call 911 for help in the case of emergency. • ALWAYS check your BG levels one to two hours after changing your infusion set. Plan infusion set changes at meals or one to two hours before bedtime to ensure that the infusion set is inserted correctly and delivering insulin appropriately. This way you will be able to respond to problems with your infusion set in a timely manner and while you are awake. • SET pump Alerts, Warnings and Alarms to high volume before going to sleep, unless otherwise recommended by your HCP. This way you will have a better chance of waking up if there is a situation that requires immediate action. • ALWAYS check that you have enough insulin in your pump to last through the night, before going to bed. Your body needs basal insulin even while you sleep. 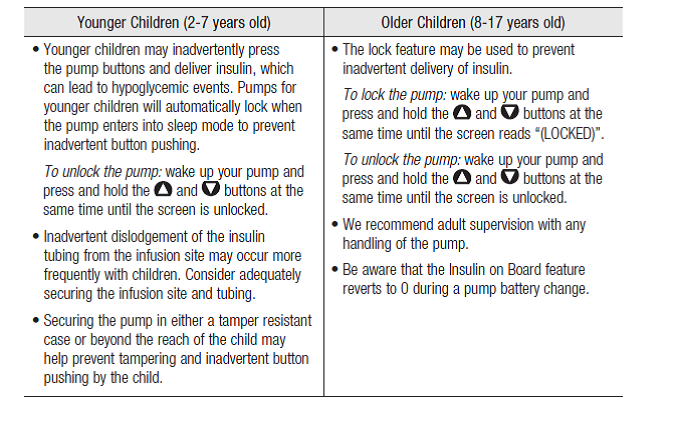 If you are sleeping, you may not be aware that your pump is no longer delivering insulin. • ALWAYS remove the air bubbles from the cartridge and tubing before beginning insulin delivery. Air bubbles represent space where insulin should be and can compromise delivery accuracy. Make sure the insulin is at room temperature, fill the cartridge slowly, and tap the cartridge to try to remove the larger air bubbles. Refer to the Instructions for Use included with your cartridge packaging for additional information. • DO NOT expose your pump to temperatures outside the range 40° F – 98° F(4° C – 36.7°C). Your pump is not designed to operate in temperatures outside this range. Extreme temperatures can affect the safety and performance of the pump. DO NOT exceed the insulin manufacturer’s recommended temperature and humidity ranges when operating the Animas® Vibe® Insulin Pump. • DO NOT use your pump if you suspect it might be damaged or not working properly. You can damage your pump by dropping it, hitting it with something hard, or not using it as intended. You should disconnect the pump or suspend insulin delivery if you think the damage might result in over delivery or under delivery of insulin. Make sure to have an alternate method for administering insulin such as pens and syringes if you are unable to use it. Before you start using your pump again, check for any visible damage to the pump, such as cracks or chips which can impact the battery contact/and or waterproof feature of your pump. Check that the cartridge cap, battery cap and infusion set are properly in place. Check for insulin leaks around the cartridge by wrapping a piece of tissue around the connection area to see if it gets wet. Turn the pump on to see if the pump display is clear. Contact Customer Service if you identify or suspect damage. • DO NOT bring your pump into areas where there may be explosive gases. There is a risk of explosion if you use your pump in these areas. Remove your pump if you need to enter these areas. • DO NOT use household cleaners, chemicals, bleach, alcohol wipes, skin prep, scouring pads or sharp instruments to clean your pump. Cleaning your pump with these materials can damage the pump. Clean your pump with a soft, lint free cloth dampened with water or a mild detergent such as liquid soap. Never put your pump in the dishwasher or use scalding hot water to clean it. See Chapter 12 in Section I of the Animas® Vibe® Insulin Pump & CGM System Owner’s Booklet. • NEVER use a hair or hand dryer, microwave oven or baking oven to dry your pump if it gets wet. The use of these appliances can damage the pump. Use a soft towel or cloth. • NEVER clean the inside of the battery or insulin cartridge compartments. • DO NOT reset the Low Cartridge Warning if the alert has already sounded/displayed, until you have loaded a new cartridge. The alert will only sound/display once for each cartridge change. If you deliver a bolus amount which reduces your remaining insulin below the Low Cartridge Warning threshold, a Low Cartridge Warning will display/sound after the bolus is delivered. The amount remaining may be lower than the Low Cartridge Warning threshold. • MAKE SURE to select the correct Battery Type on the Verify screen when you change the battery. This will ensure accuracy of the Low and Replace Battery Warnings. • It is possible that nearby devices, such as a cell phone or other wireless device, can interfere with CGM readings or alerts received by the pump. If RF communication is lost or interrupted, try increasing the distance between your pump and the interfering device to see if communication is re-established. If needed, remove or turn off the nearby device. Refer to Chapter 12 in Section II of the Animas® Vibe® Insulin Pump & CGM System Owner’s Booklet for more information on conditions that may cause RF communication problems. • DO NOT use the Dexcom G4® PLATINUM Sensor and Transmitter if you are pregnant (or planning to get pregnant) or on dialysis. • DO NOT use glucose readings from the G4® PLATINUM Sensor and Transmitter to make treatment decisions, such as how much insulin you should take. The Sensor and Transmitter do not replace a BG meter and BG values may differ from Sensor glucose readings. Using glucose readings from the Sensor and Transmitter to make treatment decisions can result in serious injury or death. • DO NOT ignore symptoms of high and low BG levels, even if your Sensor glucose readings indicate you are in control. If your Sensor glucose readings do not fit with your symptoms, you should always measure your BG level with a BG meter. Relying on Sensor glucose readings to treat symptoms may lead to inappropriate treatment decisions and result in serious injury or death. • CALIBRATE your Sensor with a BG value from a BG meter at least once every 12 hours. Periodic BG values from a BG meter adjust the Sensor so that it more accurately reflects your body’s health status. The accuracy of your Sensor glucose readings may be compromised unless you calibrate at least once every 12 hours. Calibrating more than once every 12 hours is okay and will not affect the accuracy of your Sensor glucose readings. • DO NOT calibrate your CGM if your glucose level is changing at a significant rate, typically more than 2 mg/dL per minute. Calibrating during a significant rise or fall in glucose levels may affect the accuracy of Sensor glucose readings. See Chapter 6 in Section II of the Animas® Vibe® Insulin Pump & CGM System Owner’s Booklet for more information on how the pump displays changes in CGM glucose readings. • DO NOT use alternative BG site testing (blood from your palm or forearm, etc.) for CGM calibration. Alternate site blood glucose values may be different than those taken from a fingerstick blood glucose value and may not represent the timeliest blood glucose value. Use a blood glucose value taken only from a fingerstick for calibration. Alternative site BG values might affect sensor accuracy and result in your missing severe hypoglycemia (low blood glucose) or hyperglycemia (high blood glucose) events. • DO NOT use a broken Sensor or attempt to remove the broken Sensor if no portion of it is visible above the skin. Sensors can fracture on rare occasions. You may not be able to obtain glucose readings from a broken Sensor or the readings may be inaccurate. Consult your HCP about removing it, especially if you have symptoms of infection or inflammation (redness, swelling or pain) at the insertion site. Report the broken Sensor to Customer Service. • DO NOT place the Sensor on any other sites other than under the skin of the belly (abdomen) or, in the case of patients between the ages of 2 and 17, the belly or upper buttocks. Sensor placement has not been tested and IS NOT APPROVED for other sites. Sensors placed on other sites may provide inaccurate glucose readings and lead to inappropriate treatment decisions. This can result in serious injury or death. • DO NOT use your Transmitter if the outer case is damaged or cracked. This could create an electrical safety hazard or malfunction, and result in serious injury or death. Always inspect your Transmitter for damage prior to use. • DO NOT enter Sensor glucose readings as BG values in pump bolus calculations. Always use a BG value from a BG meter. Using a Sensor glucose reading in bolus calculations may lead to inaccurate suggested bolus amounts, and may result in under delivery or over delivery of insulin if you choose to bolus that amount. • MAKE SURE to replace the pump battery when prompted with the Replace Battery Alarm to continue recording and displaying CGM readings. The Replace Battery Alarm will stop all CGM functions, and no further CGM readings will be displayed until the battery is replaced. • AVOID bacterial contamination to the Sensor package by washing your hands thoroughly with soap and water and drying them completely before opening the Sensor package. DO NOT use any Sensor if its sterile package has been previously damaged or opened. The Sensor is sterile in its unopened, undamaged package. A previously damaged or opened Sensor may lead to inaccurate glucose readings and may cause infections or other problems around the insertion site. • DO NOT apply a Sensor until the cleaned area is dry so that it will stick better. Clean the skin at the Sensor insertion site with a topical antimicrobial solution, such as isopropyl alcohol, before inserting the Sensor. This can help prevent infection. • MAKE SURE to rotate (alternate) your sensor insertion sites to allow your skin time to heal. Avoid using the same spot repeatedly for Sensor insertion. NEVER use the same insertion site for two Sensor sessions in a row. • AVOID Sensor insertion areas that are likely to be bumped, pushed or compressed, or areas of skin with scarring, tattoos, or irritation. These are not ideal sites to measure glucose. • DO NOT inject insulin or place an insulin pump infusion set within 3 inches (7.62 centimeters) of the Sensor. Insulin delivery within 3 inches (7.62 centimeters) of the Sensor may interfere with Sensor glucose readings taken from fluid below the skin, and can cause inaccurate Sensor glucose readings. • MAKE SURE to keep your Transmitter and pump within 12 feet (3.6 meters) of each other to ensure wireless connection between devices. This is maximum range for wireless transmission when there is no obstruction. Not keeping the devices within this range may not allow the Transmitter to send Sensor glucose readings to the pump. Wireless communication does not work well through water so the range is much less if you are in a pool, bathtub, or waterbed. Nearby metallic objects may also affect the wireless connection. • STORE Sensors at temperatures between 36° F – 77° F(2°C – 25°C) for as long as the Sensor packaging/insert indicates. Sensors stored at temperatures outside this range may be damaged and lead to inaccurate glucose readings. You may store your Sensors in the refrigerator if it is within this temperature range. DO NOT store Sensors in a freezer. • DO NOT use the Suspend delivery feature on your pump if you want to temporarily suspend insulin delivery and still view CGM readings and CGM warnings. Your pump will not receive CGM readings when you suspend delivery. While Temp Basal set to OFF, CGM readings will continue to be available, although insulin delivery will be temporarily suspended. • If you are using the Dexcom G4® PLATINUM Sensor and Transmitter with your pump, suspending your pump affects the recording and displaying of CGM readings. • While insulin delivery is suspended, your CGM session (see Section II of the Animas® Vibe® Insulin Pump & CGM System Owner’s Booklet) will remain active, but CGM readings will not be recorded or displayed. As soon as insulin delivery resumes, CGM readings will start recording and displaying again. Caution: U.S. law restricts this device to sale by or on the order of a licensed physician. Animas insulin infusion pumps are indicated for continuous subcutaneous infusion of insulin for the treatment of insulin-requiring diabetes. The OneTouch® Ping® meter remote is intended to be used for the quantitative measurement of glucose in fresh capillary whole blood, and as a wireless (RF) remote control to deliver insulin from the OneTouch Ping insulin pump. The meter-remote is intended for self-testing outside the body (for in vitro diagnostic use) by people with diabetes at home and Healthcare professionals in a clinical setting as an aid to monitor the effectiveness of diabetes control. The meter remote is specifically indicated for use on the finger, arm or palm. And: Are able to adequately respond to pump alerts, warnings, and alarms. Animas insulin pumps use only rapid-acting insulin. Any delay or interruption in insulin delivery may result in hyperglycemia (high blood glucose), which could lead to diabetic ketoacidosis (DKA). Only use rapid-acting insulin that has been prescribed by your physician, and do not modify your Animas insulin pump or accessories. Establish a plan with your healthcare professional for quickly responding to any signs of hypoglycemia or hyperglycemia. Prepare and carry an "emergency kit" of supplies such as insulin, self-monitoring blood glucose test strips and meter(s), urine ketone test strips, and insulin syringes or pen as a back-up plan. If you are going to have diagnostic or surgical procedures that expose you to X-ray, CT scan, MRI or any other type of radiation therapy, may need to remove your insulin pump (and meter-remote), and place them outside of the treatment area. For specific procedure information please refer to the instructions for use that accompanied your insulin pump. Consult your healthcare professional for direction in maintaining your blood glucose levels during these type of procedures. Animas insulin cartridges are intended for single use only. Reuse of the cartridge can negatively impact product performance and can potentially contribute to infection, under-delivery of insulin, and insulin contamination. This device generates, uses, and can radiate radio frequency energy and, if installed and used in accordance with the instruction, may cause harmful interference to radio communications.